The NBA playoffs have arrived. The early weeks of spring are always the best time of the year. Sports fans are treated with the return of MLB baseball, the NHL post season, March Madness, WrestleMania and of course, the NBA playoffs. For the Raptors, the path to a title begins this Saturday against the upstart Orlando Magic. The Magic had to use every trick in the book to sneak into the playoffs. You have to wonder how much energy they have left after clashing against the most desperate teams in the league throughout the final weeks of the season. 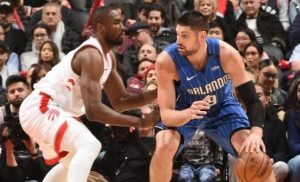 The Magic were unable to take a night off and had to play desperate basketball to secure their position while the Raptors had the benefit of being able to rest their players arbitrarily down the stretch. Can the Magic recharge for a quick turn around against the most confident, versatile and dangerous Raptors team in franchise history? That seems like a tall order for Coach Clifford and his young, untested squad. To their credit, the Magic have played the Raptors tough, splitting the season series 2-2. But the playoffs are a whole different animal. Let’s take a quick look at how these teams match up. The power of the Magic resides in their imposing frontcourt. They are a team built on their strength and physicality and no where is it more epitomized than in their bruising All Star, Nikola Vucevic. The Raptors have found themselves lost on Vuc Island on a couple of occasions this year as the throwback big man has manhandled Toronto for rebound dominance and post positioning. Alongside him are the gangly athletic bulldogs Jonathan Isaacs, Wes Iwundu and Mo Bamba. Together, this group can shut down the lane, gobble up rebounds, snuff out scoring chances and scare players away from the paint. The Raptors once had the hulking Jonas Valanciunas to throw at Vucevic but Masai has revamped his team to bring out a more complex and versatile attack. Toronto’s frontcourt is now garrisoned by an effervescent core of savvy players. 3 time All Star and former defensive player of the year Marc Gasol is flanked by his former Spanish national teammate Serge Ibaka and the enigmatic Pascal Siakam. Instead of building their frontcourt around bruisers or leapers, Toronto has chosen to fortify the paint with diverse, intelligent, switchable defenders that can also do damage (often significant) on the offensive end. I wouldn’t be surprised to see the Raptors concede the battle of the glass more often than not. The Magic are stingy defenders and scoring points in the paint may be at a premium. 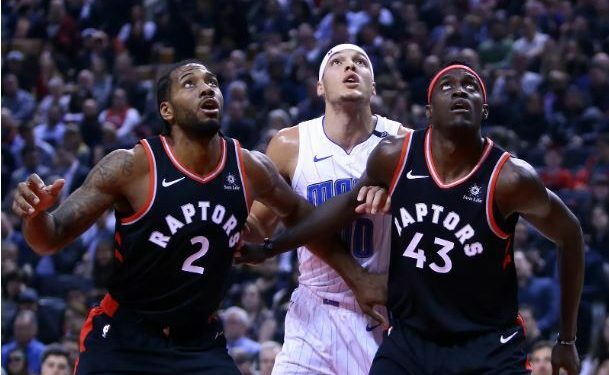 However, Orlando is inexperienced and raw while the Raptors frontcourt is playoff tested (Gasol, Ibaka) or on the precipice of breaking out (Siakam). Raptors will lose the rebounding battle but will win the war in the paint. Advantage: Toronto. 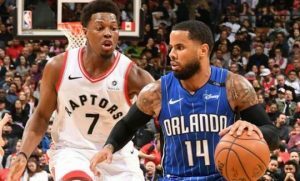 Orlando will look to match Toronto’s potent swingmen with a trio of young veterans in Aaron Gordon, Evan Fournier and Terrence Ross. Aaron Gordon built his fame off his dunking prowess but has worked hard to develop the other aspects of his game. 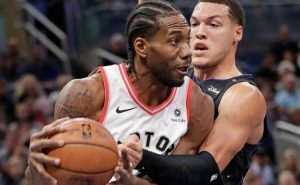 Using his freakish athleticism and physical attributes he has played Kawhi well, but he is sorely inexperience and susceptible to unforced errors. Fournier will bring some creativity and playmaking, but Toronto defenders will give him little room to get a good look at the rim. Finally, Terrence Ross may be the Magic’s wildcard. He has exploded in these final weeks with dead eyed shooting and electric playmaking. He will be a menace to chase around screens and could do some serious damage from deep if he gets space. The Raptors will match Orlando’s attack with a group of intimidating players of their own. Kawhi Leonard is easily the best player in the series. His defense is All-World, and his offensive production is among the most efficient in the NBA. Added attention on Kawhi will open space for Toronto’s sharpshooter Danny Green. Green is enjoying an incredibly accurate season and is absolutely devastating from beyond the arc. Based off a history of dynamic performances, Norm Powell has shown that “Playoff Norm” is not just a nickname. He has stepped up his game when it matters most on many occasions. Finally, OG Anunoby* could quietly be Toronto’s secret weapon. I can see Coach Nurse sicking him on an unsuspecting Magic forward who will surely see a dramatic fall in player efficiency. How can you bet against a line up that features a top 5 player, one of the deadliest shooters (and plus defenders) in the NBA, a surging young playoff vet, and a defense first physical dynamo? I can see the Magic doing damage in spurts, but I can’t see how they can stop the potential onslaught of offense that this unit can bring. Kawhi will show his class and prove that he is as good as advertised. Advantage: Toronto. The Magic will be helmed by the seasoned DJ Augustin and the young Jerian Grant. DJ has been in some battles, but he hasn’t proven to be a winner. He can stick the midrange jumper and create off the bounce (a little bit) but his range is limited, and he has lost a step over the years. Jerian is still trying to find his footing in the NBA, but he has shown flashes of brilliance. He will be in it tough against the hungry Raptors and will be banking on is youthful exuberance to make an impact. The Raptors will counter with playoff vets Kyle Lowry and Fred VanVleet. This is a “show me” playoff run for Lowry. After losing running mate DeMar DeRozan in a pre-season trade, all eyes will be on the impulsive guard to see what he can do when the lights are shining the brightest. The good news is that Lowry will be surrounded by the most talented collection of players he has ever played with. Players that will demand close coverage or extended double teams which will allow Lowry to break through with a strong series. Kyle will be complemented by the sharp shooting Fred VanVleet who will also be able to take advantage of extra space to hit from distance and slash to the rim. Freddy has been masterful as the second ball handler and backup point guard. The Magic guards appear unassuming, but they may in fact turn out to be scrappier than anticipated. They have found success despite being overlooked and underappreciated and could prove to a be a source of positive play on this youthful Magic squad. The Raptors guards are obviously better shooters and Orlando will have a hard time matching their offensive production. VanVleet will take advantage of soft spots in the Magic D while KLOE will win out in the battle at the point. Advantage: Toronto. I have confidence that Toronto will take care of business against Orlando and win the series in a gentleman’s sweep, 4-1. The Raptors have been talking about their focus on the playoffs all year and that the regular season was just to prepare for this moment. Now is the time to prove that they are more than just words and to make an example out of the Magic. Granted, this is the NBA, and anything can happen, the Magic are good enough to push the series to game 6, but unless something unprecedented occurs, I see it ending in 5. *Prayers up for a quick and healthy recovery for OG Anunoby. Marcus Ottey Posterizes Defender In Orlando!